Find Convenience at Hotel's Houston, TX LocationWhether you're in town for business, leisure or for a visit to Houston's Texas Medical Center, our hotel's location is ideal for your needs. We're right off I-610 and just minutes from NRG Stadium Rice University and the world's largest medical center.Our hotel's location in Houston is ideal if you are in Houston visiting the Texas Medical Center. We offer shuttle service to major medical institutions such as MD Anderson, Texas Children's Hospital and Baylor Clinic.For relaxation and family fun, enjoy a picnic or visit the zoo in nearby Hermann Park, or take part in a yearly tradition at the Livestock Show and Rodeo at NRG Stadium. Love to learn? The Museum District a few miles away can keep you busy for days. The convenient access to the Stella Link Shopping Center and the opulent Galleria makes it easy to enjoy the best shopping in Houston.You'll find it easy to stay on top of your exercise routine in the 24-hour fitness center. You can rest without a care at the Gazebo Grill. 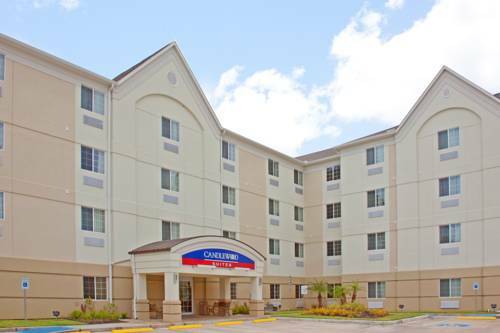 With the Candlewood Suites Houston Medical Center hotel's free guest laundry facilities, affordable Candlewood Cupboard store and free coffee bar, you'll feel right at home. Come enjoy one of the most convenient hotels in Houston as our guest!NRG will be hosting Houston Livestock Show and Rodeo,Off Shore Techology Conference andMonster Jam in the upcoming months. Please come out and enjoy the fun. Local rail system. Travels to/from Downtown area via center of the Texas Medical Center Area.